Yoga for Athletes by guest blogger, Carolyn Fallon. Throughout most of my life I have been an athlete of some kind – whether it was participating in various sports in school or playing recreationally on different club and intramural teams in and after college. As an avid athlete, I find that there are other aspects that are part of being an athlete than just the physical skill that each particular sport calls for. There is a need for various characteristics personality-wise, but what I find is extremely important no matter what sport I am playing is the need to be fit and in shape in every way possible. As I have (yes, I will admit I have been out of college for a few years…) gotten a bit older, I have come to find that yoga is a great activity that allows me to be fit regardless if I am playing sports still, and also helps me have an edge over all the athletes out there that believe there is no “real use” for yoga! Of all the workout styles, yoga is the oldest and most comprehensive practice combining weight-bearing exercise, cardiovascular endurance and meditation. Many people associate yoga with general fitness or just for people who “aren’t athletic”, but a growing body of literature on the effects of yoga on athletic training is changing this. Researchers have found a number of unique and positive results that have come from athletes adopting a regular yoga routine. Yoga begins with a focus on increasing self-awareness. It starts with the control of breath. Once the individual has learned the use of different breathing styles effectively, these are incorporated into both static poses and dynamic movements that differ based on the particular school of yoga. 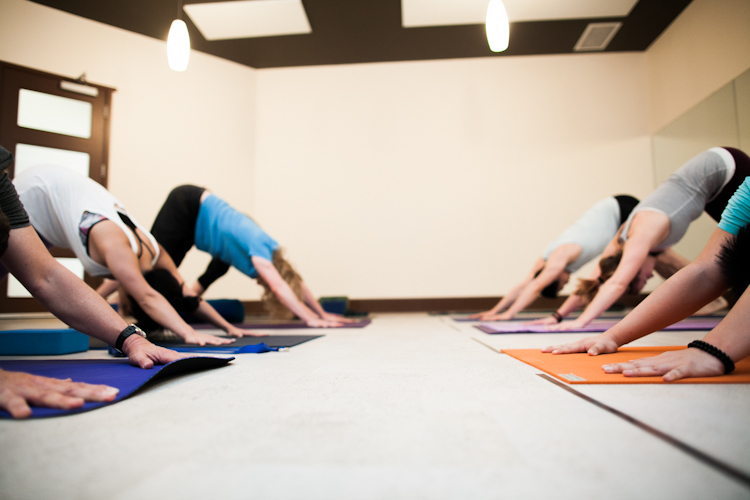 Once these beginning aspects of yoga have been mastered, athletes can begin to use yoga to propel themselves past the workout plateau by increasing athletic strength and flexibility, while also protecting themselves from various injuries. Yoga and Strength There are all kinds of ways that yoga can increase an athlete’s strength, training potential and even their recovery time. Just from the practice of controlling one’s breathing, results have been found in the increased strength of people’s grips. Additionally, as athletes become more practiced in yoga they will begin to move in to more vigorous types of yoga, such as power yoga and ashtanga, which will demand more exertion from them physically, and in turn improve their strength over time. Furthermore, because specific sports tend to emphasize certain muscle groups at the expense of others, yoga allows athletes to increase their core strength (and seriously, who doesn’t want that?!) and ultimately optimize their overall training efficiency! Yoga and Flexibility Athletes have more to worry about than just muscle strength. The tendons, ligaments and other connective tissues of the joints must be trained to handle the extra work of the muscles. Unfortunately, athletes often face the reality of compromised joint health after only one or two decades of training! This problem is largely preventable with the practice of yoga. In fact, many orthopedic surgeons attest that yoga is excellent for strengthening both flexibility and balance. I think we can all agree that these are both pretty important aspects for any type of athlete! No matter what sport is involved, the constant movement and exertion that is expected of an athlete’s body can be exhausting. Exercising in general can make one’s legs, back, shoulders, and many other body parts feel sore and tight. Restorative yoga can help athletes to get back to their normal range of motion, which prevents future problems from occurring the next time they are active. Another benefit of yoga in injury prevention is the effect of increased circulation and reduced swelling which allows athletes to return to normal training without a hitch. Yoga has so much to offer the modern athlete! It combines a body-focused meditation with complete joint and muscle workout, and has proven results that include better muscle coordination, faster recovery times, reduced fatigue due to efficient oxygen use, improvement to long-term joint stability and a reduction in athletic injuries. With so many benefits coming from the practice of yoga, what athlete wouldn’t want to try it out?! Our coffee guide today comes from Allie White, Transformational Holistic Health Coach and all-around wealth of knowledge in all things healthy and happy. Her mantra is clear: Helping fun-loving women experience a whole new level of energy, beauty, and confidence so they can create the body and life they love with ease. Grab a quality cup of coffee and enjoy! Are you one of the many people wondering if coffee is healthy for you? There is so much conflicting information out there, it makes it difficult to know for sure if coffee is beneficial or detrimental to your health. Depending on your situation, coffee can either be part of a healthy diet or really harmful, causing further health complications. I’m sure you’ve heard about the many health benefits of coffee. Yes, they’re true! Coffee is loaded with antioxidants and full of magnesium; it can lower the risk of type II diabetes, help prevent Parkinson's disease, and lower the risk of liver cancer and disease. Sounds pretty good! So if coffee is so healthy, then why aren’t you seeing the benefits? Most coffee is very high in pesticides, which are linked to cancers, neurological disorders, and endocrine disorders (thyroid disorders, hormonal imbalances, adrenal fatigue, menstrual problems, and much more). What We Put In Coffee: Chemicals, Creamers and Sugars….Oh My! In addition to the pesticide concerns, there are two more components we put in coffee that keep us from experiencing its health benefits. Sweeteners: Putting poor-quality sweeteners in coffee adds unwanted chemicals AND calories. Case in point – Starbucks most popular blended coffee drinks rack up about 500-750 calories per 16 ounce serving. Most of that is sugar, which converts in the body to fat. Artificial sweeteners: These sweeteners add to the chemical load of the body, convert into other more carcinogenic substances during the body’s own detoxification process, and increase the carbohydrate cravings. Yikes! Most creamers or coffee lighteners that are sold as such are some of the lowest quality dairy products on the market. These may contain added hormones and/or antibiotics from dairy cows and chemical additives to replace the fat removed in low fat milk. If you think non-dairy creamers are a better choice, guess again. They contain hydrogenated oils (trans fats), casein, corn syrup solids, soybean, canola and/or sunflower oils, artificial flavours and colours, etc. (basically a storm of chemicals). 1. Choose high quality coffee - organic, fair trade, shade-grown. 2. Drink black or add: Teaspoon of organic unsalted grass-fed butter and/ or some coconut oil or MCT (medium chain triglyceride) oil. (I prefer organic, virgin, cold-pressed coconut oil.) * If you the blend coffee with butter or oil, it will get frothy and taste like a richer, healthier latte. Major yum! Sweeten with flavoured or plain stevia. 3. Do NOT drink on an empty stomach. Start your day with water, eat breakfast, and then enjoy your coffee. This will help prevent hormone and blood sugar imbalances that can lead to weight gain, insulin resistance, diabetes, and much more. Yes, this magic coffee formula is very helpful but it doesn’t solve every problem. Even if you follow this formula you still might experience harmful health effects from drinking coffee. Should you quit drinking coffee? While we’ve seen that coffee does have health benefits, the amount of caffeine that is present in coffee may be causing problems in your body. If you have any of the following health challenges or concerns, you may want to consider reducing or eliminating coffee and caffeine. You NEED coffee to function. You have adrenal fatigue - you're exhausted all the time no matter how much you sleep, you never feel great and/or energized, exercise and other activities cause more fatigue. If you eat a highly processed, acidic diet including meat, dairy, alcohol, and sugar. Coffee is acidic and will further damage your liver and body leaving you more depleted. You have hormonal imbalances or blood sugar imbalances. Coffee gives you a JOLT of energy, followed by a crash, a headache, a stomach ache, and hunger. If you said YES to any of these, you may want to reconsider your coffee habit. Switch to green tea for a while, unless you'd like to go cold turkey. Switching to tea not only cuts hard-to-digest, acidic dairy from your diet (if you drink latte’s), but also strengthens your immune system and gives a boost of antioxidants. You may also want to consider the fact that coffee has a half life of about seven hours, meaning if you have a latte at 3pm the caffeine will still be in your system at 10pm when you'll want to be winding down for bed. Coffee after 12pm may prevent you from getting quality sleep. If you can, skip the coffee after noon and notice how if effects your sleep patterns. If you have insomnia or high stress, eliminating coffee can make a huge difference. There you go! It’s time to get curious and tune in to what your unique body is telling you instead of looking outside of yourself and listening to a specific diet or what the “experts” are saying. Only you know what is right for your body. This can take time, so remember to be compassionate with yourself and have fun. Although many yoga students learn asana practice first, the ocean of Yoga has many teachings to offer. Pantajali's classical Eightfold Path places yama and niyama before asana; more teachings are categorized within these limbs as well (yogi's love their lists!). These offerings may not be a common theme in a typical yoga class, yet it is important to understand the information and apply it to our practice. The niyamas include 5 observances: Saucha (cleanliness of thought, mind and body), Santosha (contentment), Tapas (spiritual effort), Svādhyāya (self-study), and Ishvarapranidhana (surrender to God). Today we will touch on the first niyama, Saucha. As yogis we understand the importance of clean thoughts and intentions; our limiting words and judgements are a nasty byproduct of the ego. Committing to cleaning up your thoughts, words and actions cleans up your energy, your life. With less clutter we can flow through life with greater ease and clarity. With this cleanliness everything becomes easier. Purity IS health! We can think of this quite literally, finding that perfect cleanse, keeping our homes clean, and caring for ourselves properly. When we step onto our mats alongside perhaps 40 or 50 other sweaty yogis, saucha is incredibly important to maintain the respect and comfortability of the room. Honour yourself and your fellow yogi by keeping your props tidy, your mat lined up, and above all your personal hygiene tended to. Just as we expect a fragrance-free studio space, we ask that you come with an awareness of your personal saucha. Obviously things are going to get sweaty, that's the point!! But ensuring that you are coming in decently showered and such will keep the space enjoyable for all. Friendly etiquette reminder and philosophy lesson wrapped into one! Thank you and namaste. This month we are joining along in the YEG celebration of cycling! As yogis, we know how incredibly essential it is to honour our bodies with the right movement, finding balance after rigorous activity. Yoga, in all its magnificence and splendour, is the perfect compliment to pretty much anything; give me a side of asana before and/or after a long ride and I am a happy camper! Pedalling long hours astride the saddle with the neck up shortens the spine and causes tightness in the lower back, sacrum, and hips. The neck and jaw can lock up, too. Good posture and stretching will help diminish these after-effects of serious rides. First, look at your posture in the saddle. Focus on lengthening the spine—be conscious of keeping space between the shoulders and neck. Also, lift the navel to engage the lower abdomen. This will keep the support in your core to protect your lower back. Second, do these four yoga postures every day to stay loose and maximize your potential on the bike. Cat/Cow brings length to the spine in both the forward- and back-bends, working out stored tension from cycling. Downward dog will not only open the lower back, it will also strengthen it, giving you structural support when you’re on the bike. Like Downward Dog, this pose alternately strengthens and opens the low back and hips. It also lengthens the upper spine. This pose will open up the whole spine, particularly the sacrum at the base of the spine. What are you favourite post-cycle stretches? Connect with us on Facebook, Twitter and Instagram. Happy riding! Every so often there seem to be these "all the rage" foods that come along and flood our radar. The current superstar on the block? BEAUTIFUL LEAFY GREEN KALE! Whether you're ordering it at a restaurant, cramming it in your smoothie or massaging it for salad, there is a reason this vegetable is getting serious attention. Here's 10 facts about kale that may get you on board or confirm what you already know. 1. Kale is low in calories, high in fiber and has zero fat. One cup of kale has only 36 calories, 5 grams of fiber and 0 grams of fat. With its high fiber content, it aids in digestion and elimination and is also filled with so many nutrients, vitamins, folate and magnesium. 2. Kale is high in iron. Per calorie, kale has more iron than beef, which is essential for good health (formation of hemoglobin and enzymes, transporting oxygen to various parts of the body, cell growth, proper liver function and more). 3. Kale is high in Vitamin K. Eating a diet high in Vitamin K can help protect against various cancers. It is also necessary for a wide variety of bodily functions including normal bone health and the prevention of blood clotting. 4. Kale is filled with powerful antioxidants. Antioxidants, such as carotenoids and flavonoids, help protect against various cancers. 5. Kale is a great anti-inflammatory food. Just one cup of kale is filled with 10% of the recommended daily dose of omega-3 fatty acids, which help fight against arthritis, asthma and autoimmune disorders. 7. Kale is high in Vitamin A. Vitamin A is great for your vision and skin as well as helping to prevent lung and oral cavity cancers. 9. Kale is high in calcium. Per calorie, kale has more calcium than milk, which aids in preventing bone loss, preventing osteoporosis and maintaining a healthy metabolism. Nutritionista and Natural Foods Chef - Kristin Fraser! Kristin, a former mechanical engineer, took the plunge and trained in New York City at the Natural Gourmet Institute as a Natural Foods Chef. She is a Certified Holistic Nutritionist as well as Living Foods Instructor and is here to share recipes, education and fun around health and nutrition. Check out her website www.innerglownutrition.ca for more wholesome goodness and to download her free recipe package. Here she shares one of her favourite cookbooks and some insights on how food can affect your own self realization. It’s not easy being a health nut – you know, staying on track, avoiding all those temptations you used to love, working at dealing with stress in different ways than you are used to. Slug back a beer or go to yoga… hmmmm… But it sure isn’t easy NOT being one either - having to deal with excess weight creep back or digestive disturbances from poor food choices, or getting what I call “food hangovers” from eating too much sugar, consuming too much caffeine or just eating straight up too much junk. I am consistently humbled by the social workings of the world and how choosing health still seems to be outside of the “norm”. It’s much more normal to fry up the bacon, drink a beer, eat a bunch of cupcakes and puff back a cigarette than to engage in all these healthful activities like eating fresh fruits and vegetables, avoiding sugar and alcohol and practicing yoga or meditation. Not that everyone needs to be a vegetarian to be healthy or experience the shift, but having the awareness that food not just affects energy but how your choices affect your emotional and spiritual wellbeing as well is an important and ongoing step. When you cut out sugar and refined foods you start dealing with the real emotions behind why they were consumed in the first place. There’s a whole lot of self love that needs to come into play and when they break through that – the real glow starts to shine through. And not from a buzz from a few beers or a high from sugar, but from the pure essence of your “true self”. Think about some dietary changes that you could make to stay on your true path. Are you experiencing your self realization diet? Digestion, the actual breaking down of a whole into its parts so that the pure can be extracted and incorporated into the body and the impure can be expelled. We tend to think of digestion as a physical act of our food being broken down and made into usable energy (ATP) for the body, which it is; however, we tend to forget that we are digesting everything all the time. We digest emotions, reactions, life events, basically anything that is brought in to the body from the external and is internalized needs to be digested. When we don't slow down enough to allow the body to shift into our parasympathetic nervous system, rest and digest, we not only literally put our active food digestive system to halt, we don't digest life's events either, both of which get stored in the body in different ways, shapes, and forms, eventually bunging the body up and cause a reaction. Typically IBS, constipation, diarrhea, acid reflux, indigestion, epigastric discomfort, etc are our digestive tract issues; emotionally we see a restless or dull mind, anxiety, and even depression from lack of glucose able to go to the brain. How to cure digestive woes? It is a life style. It is NOT a momentary diet, though these can be helpful to get the digestive system back on track. If we want to truly nourish our health, it is through our food and it is over our entire life span from the moment we choose to be healthy to the moment we pass on. It is healthy living, it is choosing to love yourself so much that you only want to put good things into your temple/vessel/body. People change their diets when they are pregnant so that the baby has a chance to come out healthy, but why do we ourselves not want to be healthy? Marketing? Corporations tell us otherwise? If you are truly wanting to uplift your digestion, you must uplift your Self first, so eating healthy comes from a place of truth and yearning for well being, not from a place that wants to be skinny so that other people will think you are perfect. It is meditating so your mind is clear and free of desire, it is avoiding rag mags, tv, and general advertising that makes you think you need to be anything more than your truest self. At the core of your being, you want to live a fruitful, healthy, happy life and I can guarantee you, that truth does not say " I want McDonald's." Sarah is leading the upcoming 'Digestive Restore' workshop at Yogalife Studios North this weekend. This session is full but please stay in touch at info@yogalifestudios.ca to learn about her next one! Each day I get at least a handful of press releases sent to me — new products, recent studies, contests, requests for me to share info… you name it, I’ve probably gotten an email announcement or press release about it. As we move into Autumn, we tend to spend a lot more time indoors and more time may be spent at the gym, as we prepare for "hibernation." With that in mind, I know how frustrating it can be to "spin your wheels" or have a bit of false information or fear-based info. SO, here are the top 8 myths that the Canadian Exercise Journal has hoped to clear up! Myth #1: Stretching before exercise reduces the risk of injury- False. The scientific literature of the past decade fails to support stretching before exercise as a successful strategy for injury prevention. However, research does support stretching at other times, including post-exercise, to reduce injury risk. Myth #2: Walking a mile burns as many calories as running a mile. – In our dreams. While walking is a great physical activity, it does not require as much energy as running. Research has shown that running has a 40 percent greater energy cost compared to walking. That means you burn more calories when you run. Myth #3: Lactic acid causes acidosis and muscle fatigue during exercise. – False. This century-old myth, linking lactate or lactic acid to fatigue, is the result of a scientific misinterpretation that has prevailed through the years. Lactate does not cause metabolic acidosis. Furthermore, it is useful in the performance of exercise at high intensities. Myth #4: Lower-intensity exercise puts you in the fat-burning zone, so it’s preferable to higher-intensity exercise. – Wrong. The “fat burning zone” at low intensities of exercise doesn’t even exist! The best approach is to think of energy expenditure as a calorie is a calorie is a calorie, rather than partitioning into carbohydrate and fat calories. To burn maximum calories in support of ongoing weight loss, progress to a moderate-intensity/higher-volume exercise program and include interval training. Myth #5: Morning workouts increase metabolism better than workouts performed later in the day. – Wishful thinking. Research has clearly shown that total energy expenditure is equivalent across different meal and exercise orders. Therefore, the decision to exercise in the morning should be driven by personal preference rather than any false hopes that greater weight loss will be achieved by exercising before breakfast. Myth #6: Muscle weighs more than fat. – Not true. Muscle does not weigh more than fat. A pound of muscle weighs the same as a pound of fat. The difference is their density. As we lose fat and gain muscle, weight may change very little, while body volume decreases as we become leaner. Myth #7: Women who want to avoid looking bulky should avoid resistance training. – False. Resistance training does not cause women to get bulky. In fact, it is virtually impossible for women to get as big (i.e., bulky) as men due to physiological differences, such as lower levels of testosterone. Myth #8: Spot reduction really works, especially if you want six-pack abs. – In our dreams. Research shows that if a vigorous, high-volume, core-training program is performed, fat will be reduced in the abdominal area, but not selectively. A lean midsection requires, then, a total program of core, resistance and aerobic exercise—not just a focus on the abs. We sincerely hope this helps as you move forward in any of your fitness endeavors! The poison in the words numbed my body and my soul. All of a sudden, there seemed to be a big hole where my heart used to be. Survival mode kicked in and I started protecting that “empty” space. For me, it was isolating myself from social situations, even work. I sunk myself into spiritual reading, grasping for any words that might fill the hole. This was the first time I had felt it. Heartbreak. This was my first experience feeling something so painful that I fell into the cycle we all do. It turns out that emptiness is atrophy. When there is no love in the heart, it is like a precisely tuned machine with nothing to produce. It just sits there and begins to rust. So, I, as do many of us, waited for the pain to subside behind the walls built from heartbreak. All the while, my heart sat rusting. Hmmm. Now I’ve got a rusted heart and a bunch of walls to break through. There’s got to be a better way…and there is. It is said that there are two ways to deal with pain. One is to shut your heart off so it won’t be hurt; the other is to open it bigger to allow more love to find it. These are odd phrases, you know? Your heart is a muscle. It has inherent strength that can be made stronger, like every other muscle, by using it. Even when hurt, continue to build the heart muscle from use. Yes, it’s weakened by the sting, but it’s still capable of all the strength it had before. A strong, loving heart is more prepared to absorb hurtful blows than weak attempts to hide it from the world. Even a broken heart continues to feed the body. Grow your heart by learning from the pain and continuing on. Continue on as before, loving as deeply as you can. The more you love, the more strength your heart retains and builds. Imagine your heart as a castle. When something approaches, let it in just as a castle’s drawbridge lets in its guests. Let your still loving heart’s strength protect you from emotional attacks, catapulting letdowns, and poisonous relationships, like the stone walls of those castles. You see, walls are built stone by stone. Let your stones be loving acts both given and received, instead of compounding defense mechanisms. Give and be grateful for receiving each piece of strength to your wall, knowing there’s still a drawbridge. I loved “her” dearly, you know? No matter how much it hurt, though, I couldn’t un-know that love. The pain subsided, but the love was just as strong—just still there. Those that I meet now that approach my castle are greeted and welcomed with the love I learned from her. Sure, some may aim to hurt, or do so unintentionally, but they have no idea the strength they’re up against. Love after love, my heart becomes stronger. With each loss, a new layer of muscle rebuilds over the last. With a stronger a heart, a stronger love, and a new, different, more beautiful cycle is born. So, what was the point of the defense mechanism walls? Nothing. They only served to contain, block, and otherwise stifle the beautiful strength the heart could build. The more you compound your defenses, the more you stifle your heart. The longer you wait to love, the more your heart rusts. Conversely, the more you simply love, the stronger your heart-wall becomes and the more able you are to absorb the hurt and build again. The pain still comes, soft and far between. My eyes still tear. But now, it’s for the memory of that time we shared, the gratitude for the biggest lesson, for the little piece of my heart that tells her it’s okay when she’s staring at the ceiling in the middle of the night. Crazy, isn’t it? I left a piece of my heart with her. My heart shouldn’t be as strong as it was, let alone stronger. But it is, because the heart, like any other muscle, gets strong with use. Build your heart. Love with every opportunity. Be readily prepared to open that left ventricle when the charming knight or beautiful princess arrives. This workshop is to help people prepare their body for the cycling season. Most regular cyclists, whether recreational or competitive, will experience similar physical issues of tight hamstrings, low back issues and shoulder tightness. We will work on form on the bike, use yoga stretches to minimize these issues, engage in breath work, and head out for a short ride together, weather permitting (please bring your bike and helmet). The workshop will be fun, engaging, and informative. Riders of all abilities are welcome to come and learn how yoga can enhance your cycling experience! Fear is about the loss of familiar things. We fear losing the jobs we don’t like and the people we don’t love. This is what keeps us stuck in insanity. We fear losing the comfort of a habit that gets in our way. This is why we continue to numb ourselves. We fear the loss of pleasures that we enjoy. This is what causes us to lie, cheat or steal. We fear losing our youth. This is why we are deceitful about our age or try to stay forever young. We fear losing our money or never having enough. This is what causes us to ignore the people around us and to work an insane amount of hours. We fear losing our status or recognition. This is what causes us to pretend to be someone we’re not. We fear death or losing our health. This is what causes us to ignore and neglect the elderly population. We fear losing our children. This is why they can't talk to strangers or play in the front yard. We fear losing our sense of identity. This is why we worship our degrees, titles and live in cubicle prison. We fear losing our sense of safety. This is why have stuff packed in storage units and supplies stockpiled for doomsday. We fear feeling unlovable and being unloved. This is why we become people-pleasers and lose our souls in the process. The only way to get around this nonsense is to understand that we really don’t have any of these things to begin with. Every thing is subject to change and alteration. Safety is an illusion. The only thing that we can count on is the present moment. Notice that you are safe right now and get on with what you need to do! Get rid of fear, love others and yourself, play, be authentic, take risks, show gratitude. You have today and this present moment. You are trading a piece of your time that you can never get back for this exact moment. Let that moment be something good. Many of us have been there. It may be a spouse, an employer or employee, a trainer or mentor, or worse still, yourself. Sometimes it's hard to know whether you are in good, mutually supportive relationships with your partner, friends and family. Some of these ring extremely true for me, and I am thankful that I have removed all of them, grown, learned, moved on, and flourished. It’s all about the other person — your needs, wants and desires don't rate. You feel tired, drained or exhausted being around this person. You're afraid to express your opinions, thoughts or feelings. The person mocks your looks, occupation, activities, mannerisms, family and friends. You constantly feel unhappy or complain about the relationship to others. You often play the parent or therapist role — even if it's for your parents! You compromise yourself to maintain the relationship. The person attempts to control aspects of your life like activities, finances, schedule, social outlets and friends. You lack trust or you feel unsafe. The other person takes out his or her bad moods on you. Abuse, be it physical, emotional, sexual or financial (this is NEVER acceptable). If this sounds like you, talk to someone independent about what is going on in the relationship. This may be a professional, like a psychologist, or a friend or family member who's not too involved. An expert can give you a new perspective on the relationship; sometimes we live relationships in our head, rather than in reality. Having someone look at situation objectively can help you sort out what's really going on in the relationship. It may also be be helpful to look at what you can be responsible for. The way other people treat you can be a reflection of the relationship you have with yourself. What can you do to start taking care of yourself? You teach people how to treat you, as my wife always reiterates! Being very clear on who you are, what you want, what you need and maintaining your commitment to that is ultimately the best way to avoid creating toxic relationships.One of my favorite quotes rings very true here...It's better to be healthy and alone than sick with someone else. My wish is that perhaps this blog helps even just one person, or at least gives you something to contemplate. Thank you for being open to reading it. Controversial topic alert. But a topic that needs to be addressed. PLEASE take the time to read. This may help you, or a loved one. Trust me. This is a topic that is near and dear to my heart. A topic I have seen first hand in many people and areas of my life. Compulsive exercise. Negative body image. Trying to find "the secret." Unhappiness with an unattainable body type. Did you know that only 2-5% of the world's population has the GENETICS to look like some people do on magazine covers? I realize and understand that many people KNOW or are aware of some of these things, but as we move into summer season (bathing suits, short shorts, etc.) I feel a responsibility to address this potentially sensitive, but very real topic. Within the yoga environment, and any other one for that matter, it is easy to get caught up in thoughts of "weight loss" or body image/body dysmorphia. It's easy to be disappointed with the perceived lack of your progress when it comes to your goals. In my opinion, the most important goal when it comes to exercise should be how you feel. How you feel is most important. Inside and out. How you feel, not how you look. Easier said than done. I understand and appreciate that. What I also know is people are beautiful. You are beautiful. There is beauty everywhere, and a number on the scale does not define you or your beauty. Please, please remember this always. Please. You are you and you are beautiful. Please take care of yourself. "If you can't see anything beautiful about yourself, I strongly urge you to get a better mirror." Professionals specializing in the treatment of men, women and children with eating disorders re observing a growing trend among their patients, who are increasingly engaging in compulsive exercise Exercise anorexia is recently accounting for 40% of all eating disorders (excessive exercise, with very little to no eating). “Compulsive exercise is obligatory in nature, and it doesn’t have to be a certain type of exercise or be performed for a minimum duration,” explains Jennifer Lombardi, MFT, executive director of Summit Eating Disorders and Outreach Program, a partner program of Eating Recovery Center. When evaluating if exercise is compulsive in nature, it’s important to look at the intention behind the movement, if there is a sense of urgency or agitation when individuals can’t engage in the exercise behavior, there is likely an issue (please note that this is not the same as feeling like you need yoga. Sometimes you just need to make it to Yogalife and breathe and move and be amongst our community. Just evaluate if it is a compulsion). It’s also important to consider exercise in the larger context of an individual’s eating and body image history; exercise is one of those behaviors that means something different to people struggling with eating disorders due to their temperament and brain chemistry. Some eating disordered individuals abuse exercise as a compensatory behavior following a bingeing session or to give themselves “permission” to eat. This can include rewarding yourself with food for exercise, or the "all or nothing view" where even if you "cheat" on one meal, you feel as though the entire day or week is ruined. Others may begin to engage in excessive exercise as what they believe to be a “healthy” part of eating disorders recovery. What these individuals do not realize, is that the frequency and volume of their exercise has taken the place of other eating disordered behaviors as an anxiety management tool and poses significant health complications, including joint injuries, stress fractures, muscle tears, tendonitis, fatigue and dehydration. 1. Exercising excessively “just because” as opposed to intentional exercise in preparation for a competition or to simply feel good. 2. Refusing to miss a workout, regardless of weather or injury. 3. Exercising takes precedence over all other activities, including work, school and spending time with friends and family. 4. Experiencing a heightened level of anxiety if unable to engage in exercise. 5. Displaying an elevated rigidity and perfectionism with regard to exercise behaviors. I love practicing yoga and engaging in activity just as much as anyone else. I understand your love for Yogalife, for the practice, art, and expression of your yoga asana. But what I do ask of you, is to evaluate your relationship with yoga and yourself. Numbers on the scale, inches lost, etc. can be just a bonus of activity. When you reach that point and realization, you are able to engage in physical activity because you want to, not because you feel you have to. Join us at Yogalife because you love you and love how yoga makes you feel. If you are interested in being led in a heart opening and freeing practice, where we release and let go of some of these thoughts and feelings around compulsive exercise, please email info@yogalifestudios.ca or directly to me at brandon@yogalifestudios.ca. If you are interested in working through some emotions in a completely safe, nonjudgmental space, please let us know, and I will find time to run a workshop to explore, emote, let go, and transform. Thank you for taking the time to read. I understand this is a sensitive topic, but I am trying to create awareness and to offer help. I truly hope this has opened your heart and mind to realize you are not alone. Namaste.